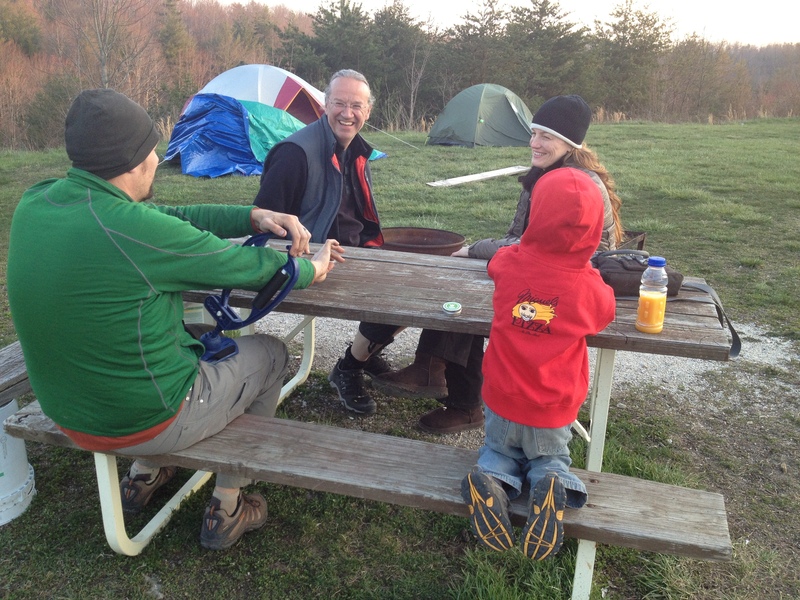 While there are any number of items you might expect to see passed around a campfire on a chilly spring evening in the middle of the Red River Gorge, a wacky-looking contraption designed to massage one’s forearms is probably not first on the list. But that’s just what happened at our campsite on our most recent trip to the Red. Why? If you assumed it was due to overindulging in one of the many other items that are more commonly passed around a campfire, you’d be wrong again. The premise behind Armaid is really quite simple (as well as scientifically proven.) You can read a more detailed description on their website, but basically everything boils down to two basic therapies – circulatory and trigger point massage. Circulatory massage flushes toxins out of the tissue and allows fresh blood and nutrients to enter into the muscle. Trigger point massage uses pressure to break up painful areas of knotted muscle fibers In layman’s terms, the Armaid provides a way for non-therapists to easily access sore, tight areas in the forearms and release the tension. Steve and I use our Armaid every night after climbing, and sometimes even more often. After a few minutes of “feel good hurt,” our previously pumped out forearms feel relaxed and rested. Call us old and geriatric, but we don’t have elbow pain when we climb…and we’re not the only ones. 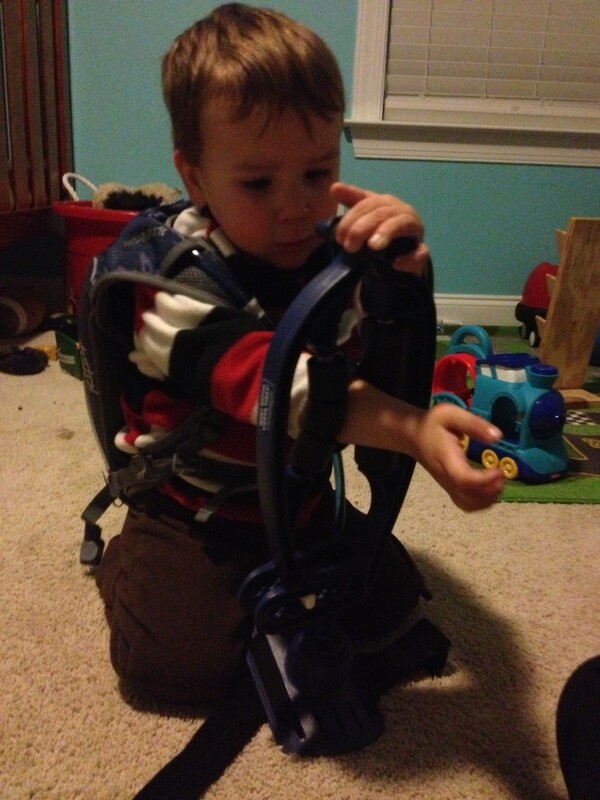 Arm-aid is good for climbers of all ages. Out of all the folks who have taken a turn with our Armaid recently, the only negative I ever hear is regarding the price. At $100, it’s not what I’d call cheap. To be honest, I think that was my main deterrent for waiting so long to buy one. However, if you compare a singular one-time purchase, self care option to multiple insurance co-pays and PT appointments to get the same result, the cost doesn’t seem like a good excuse! But for those of you without the time and money to pay for either option, there’es always “therapy in a can.” When I first spoke with Armaid inventor Terry Cross about the possibility of providing a giveaway or discount code in this post, this homemade Armaid alternative was ironically one of the first things he mentioned! In fact, his exact words were these: “If I happen to sell a few more Armaids from your article, that’s fine, but my goal is to get climbers to realize that they have a positive, specific way to help themselves with active release/trigger point techniques.” I was floored. In today’s greedy, money-hungry society, it was very refreshing to talk to someone that was in the business of helping others rather than themselves! That being said, you don’t ABSOLUTELY have to have an Armaid to benefit from these techniques…it just makes it a whole lot easier. But if $100 is too much to pay, why don’t I make it a little bit easier right now? Terry was generous enough to offer a free Armaid to one lucky reader – all you have to do to enter is leave a comment below about how you think a product like this did help/would help/could help you. (Extra entries for liking Cragmama and/or Armaid on facebook!) Additionally, Terry has offered a discount of a whopping 20% off for all Cragmama readers – simply click here and mention “cragmama discount” in the comments section when filling out your online order. Contest will run through Friday, May 31st, and the discount will expire on June 20, so act now! Best of luck, everyone! Definitely could have used one when I had golfer’s elbow! I think the manual forearm massage I did was what helped me get over it. Oh my gosh this could be such a dream. I started climbing when I started dating my husband and shortly after I became pregnant with out son my arms would go numb from just bending my elbows while crocheting. It got better after getting my elbows adjusted my a chiropractor but I can imagine this helping a ton. Oh how nice it would be to not have numb hands and have to go to the Chiropractor to do it. I like Cragmama on Facebook, which is where I found this post, and Armaid. Sign me up! I suffer from elbow tendinitis regularly…it has prevented me from climbing on several occasions. I’d love to try anything that might help! I’ve had a sore left arm from doing something besides climbing. But it’s kept me from climbing. I’d love to try this to see if it works. It has kept me from climbing. Would love to try it. Gif – From personal experience we’ve put ours through a lot of abuse and it seems very durable – it’s been drop tested by the kiddo and stuffed into backpacks and crammed into an overfilled trunk plenty of times. But just in case it does break, they also offer a 10 year unconditional warranty (doesn’t cover lost/stolen Armaids, but anything that breaks they’ll fix). Christopher – same idea as the soup cans, but MUCH easier to do! Jentri – Chiro’s can work wonders, but if this would work for you, it’d be so much easier! After just coming off a ~four month break caused by my elbow, this would be great to have for keeping me comfortable! 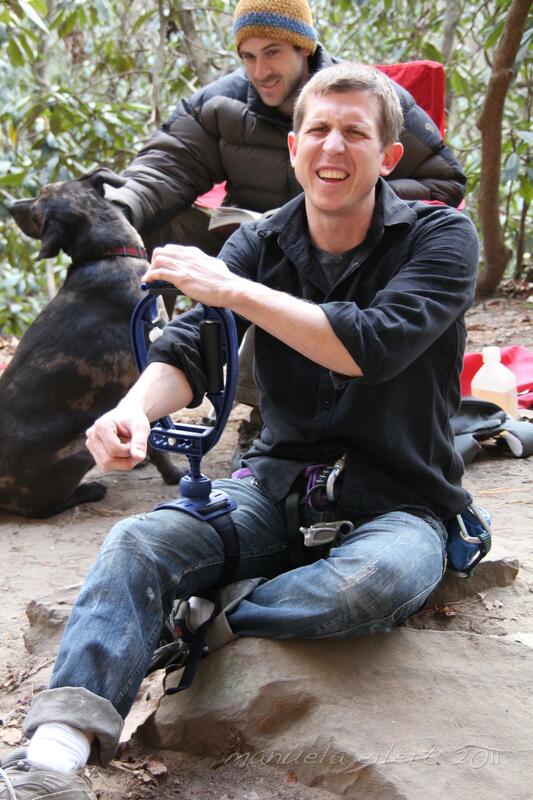 My elbows hurt and Im sure every time Ive seen you guys at the crag or in the gym Steve has to listen to me complain. So please for everyone’s sanity I would like the armaid. I have seen others use the Armaid but I have always wondered if it would work for me. I have seen the ad in the climbing magazine from time to time. I think it would be perfect for those post down time after a long day of sending or a hard gym work outs. I am a regular Cragmama reader along with Liking Cragmama and Armaid on Facebook. I’d love to try Armaid! I’ve had nagging tendonitis for the last 9 months or so (after an ill advised V10 boulder problem attempt) and nothing seems to make it feel better. I’m willing to try just about anything at this point! Andrew – And hopefully not have to take another hiatus! Adam – You’re right, it’s easy to fit into your post-climbing routine. Philip – Wow, 9 months! Hope your able to find some relief soon. Oh my goodness! I have climbed for 14 years now and am just hearing about this? We would always gather around the fire and work on each others arms. Unless there was one of us who was projecting, then that person would get ALL of the attention. The Armaid would be a welcome guest at all of our post session hangouts! That way we dont get pumped working out someone else’s pump! I’d love to try this. I have been struggling with a messed up elbow off and on since I had my little one. It seems a lot harder to look after yourself when you’re looking after a very high energy toddler! I have never used the Armaid, but I have had really great results with a new topical called Tendonex. It’s a natural material that works fast & also promotes healing. It would seem to be a good complement to Armaid to relieve elbow tendonitis. I always look forward to using it at Caleb’s, lol. It’s a great contraption and I’d love to add it to my closet of climbing tools that people stare at in bewilderment.